Anyone prowling Hollywood after dark has probably seen the very large, flashing, Vegas-like image of a tequila bottle atop a 12-story building at the intersection of Hollywood and Vine. But few of those persons probably know that the sign originally spelled out the legend, “Bank of Hollywood Building” in 10 ft. high letters without benefit of neon enhancement or lighting. The 1929 building, listed on the National Register of Historic Places, no longer houses a bank and offices, but has undergone “adaptive reuse” to become “live/work” condominiums. 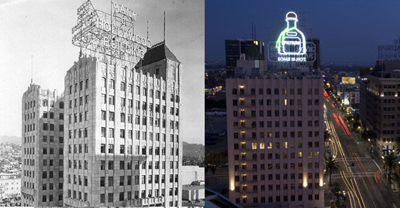 At the same time, the “Bank of Hollywood Building” sign turned into one advertising “The Lion King” at the adjacent Pantages Theater, then “Snow White” at Disneyland, and finally “Patron” tequila. And exactly why should we care? Because numerous buildings, not only in Hollywood but in midtown and other, older areas of the city, have these often ornate, rooftop signs and many persons interested in historic preservation are concerned about them getting caught up in the new, more stringent sign regulations now under discussion by the city council. For instance, all roof signs were prohibited by the ordinance approved by the City Planning Commission last March and sent on to the city council. But after concerns were voiced that historic roof signs might not be able to be renovated or replaced, an amendment was proposed by Councilman Jose Huizar to allow historic signs to be replaced, reconstructed, or recreated, and is now pending before the City Council, along with the full sign ordinance. City Building department records show that a permit was issued to convert the “on-site” rooftop sign at the Bank of Hollywood Building (more commonly known as the Hollywood Equitable Building) to an “open panel” roof sign in April, 2007. The existing sign was designated as “on-site” even though the Lion King sign that went up in 2000 and the Snow White sign that went up in 2006 were clearly “off-site” signs, advertising goods or services not available on the site. Whether or not a commercial advertisement for tequila distilled in Mexico and distributed by a company based in Las Vegas is relevant to Hollywood is debatable. What is not debatable is that the sign is part of an ongoing assault on the visual landscape of the community, and an affront to the idea of historic preservation.